On January 4, 1949, the aircraft carrier U.S.S. Philippine Sea, (CV-47), left Rhode Island bound for the Mediterranean. 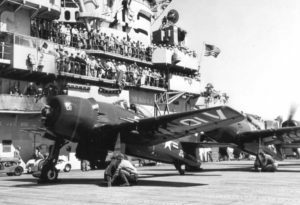 Aboard the ship was Carrier Air Group 7, which included aircraft from Fighter Squadron 71, (VF-71), based at the Quonset Point Naval Air Station. On January 11th the U.S.S. Philippine Sea was operating in the Mediterranean Sea. At 7:35 a.m. that morning, Ensign Ervin E. Goins was on the flight deck in an F8F-1 Bearcat, (Bu. No. 95165), preparing to take off. After receiving the take-off signal, Goins began his run, but after only 100 feet the Bearcat’s engine suddenly lost power. The pilot applied the brakes, but was unable to stop before going over the bow of the ship. The aircraft crashed into the water and sank immediately, but Ensign Goins was observed in the water floating face down with his parachute still attached and his life vest not inflated. A helicopter was launched to retrieve Ensign Goins, but his body sank before it could be recovered. The cause of the accident could not be determined.